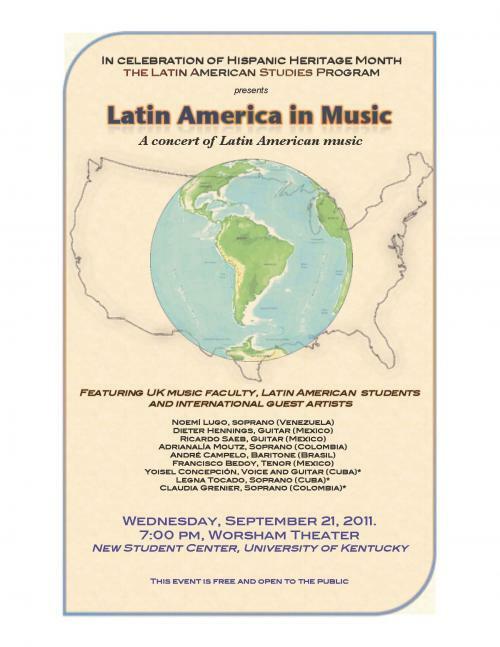 In celebration of Hispanic Heritage Month, University of Kentucky's School of Music and the Latin American Studies Program present "Latin America in Music: A concert of Latin American Music." This concert featuring UK faculty and students, as well as international guest artists, will take the stage at 7 p.m. Wednesday, Sept. 21, at the Worsham Theater, in the UK Student Center. The concert is free and open to the public. soprano Claudia Lucía Grenier, a professor at Pontificia Universidad Javeriana, from Colombia. The award-winning UK School of Music in the UK College of Fine Arts has garnered national recognition for high-caliber education in opera, choral and instrumental music performance, as well as music education, composition, theory and music history. Latin American Studies is an interdisciplinary program in the UK College of Arts and Sciences bringing together scholars who wish to understand Latin America as a major world region that continues to contribute unique and original understandings to the global community. Latin American Studies scholars pursue courses in anthropology, geography, history and the Spanish language, among others, in order to gain a cultural and geographic understanding of a specific region.